Dawn Wink contacted me last August. I was really eager to read her historical novel, especially as it is set in South Dakota, a state I enjoyed a lot for hiking a few years ago. But with book tours and a huge TBR, here is finally my review!! The novel is set at the beginning of the 20th century, and is based on the journal of Grace, the author’s great grand-mother. It opens on Grace’s wedding, on which she is faced with a major and quite unpleasant surprise. Basically, the whole novel is how she copes with this discovery, through a lot of suffering, but also comfort from nature and animals (especially a meadowlark –have you ever heard the fascinating song of a meadowlark– and a mare), journaling, and from a few local friends, mainly Mae, a female doctor and her family, and Daisy, a Lakota. And how though a zintkala Opi (a wounded bird), she will eventually learn to rediscover and appreciate life. It is a deep reflection on loneliness, suffering, and redeeming friendship. 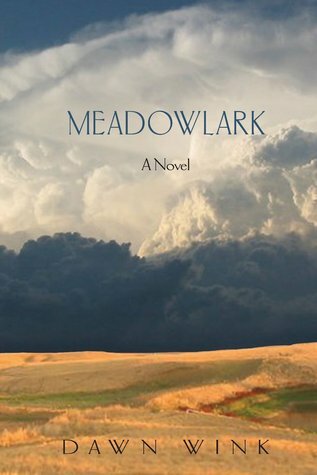 Partly inspired by the author’s own shattered life, it’s a beautiful novel about the harshness and beauty of life, harsh and beautiful like the prairie through its droughts, tornados, and the lush growth after a good rain. The characters are extremely real and likable, well no, not all of them!, and even the mare has quite its own personality! The style is very pleasant, with lots of amazing descriptions of the prairie, the wind, and the ever present prairie dogs. There are a few editing problems, such as missing words, but that didn’t prevent me from appreciating the book. I was a bit surprised and disappointed though at the major gap in time between chapters 29 and 30. The only reason I don’t put fireworks around the Eiffel Tower for this book is that it was emotionally very tough for me. There’s a lot of violence against women and tough tough passages, so this is definitely not for the faint of heart, but it certainly describes a reality common to many women of the time. There are a few things about the Lakotas and a few myths and stories, but I would have liked more of them inserted in the story. Grace took refuge in the hypnotic movement of the grass in the wind as it rippled like the surface f the sea. The prairie breathed and pulsed. Time ceased. Was there anything safe from his need to hurt and wound because he couldn’t heal himself of his own pain? The song of a meadowlark glided through the air, soothing Grace’s wounded heart. The song held her motionless. She waited, listening again for the lilting melody. Again the trill came, twisting and turning as it skimmed the still air. The beauty. The bitterness. Not a land of mediocrity, but of stunning beauty and brute force. Any living thing that can’t survive and appreciate both, will find little to love or live for on the plains. Night enveloped the ranch in an obsidian shroud. No stars peeked through the thin cloud cover. No moon shone saffron orange. No night birds offered songs of encouragement. Stillness hung from every blade of grass. Based on a true story, the author provides a captivating and crystal clear window into the lives of some of the early settlers on the plains of South Dakota. In 1911, sixteen year old Grace has the same hopes and dreams as any other bride for a future built on love, commitment and family. But she also knows that a life of ranching on the magnificent prairie she loves so deeply will require years of perseverance, hard work and suffering. What she doesn’t expect is how quickly she will be required to confront these threats to her heart and her soul. Despite challenges that often seem insurmountable, Grace builds two abiding friendships in a land where other women are very few and rarely seen. Daisy, a half Lakota widow befriends her and Grace also recognizes a kindred spirit in her nearest neighbor, Mae Thingvold, a young doctor on her own. It is these women and their connections to each other that will sustain all three through unimaginable pain and loss and bring them joy in the sharing of small victories and celebrations of milestones along the paths of their lives. Dawn Wink is a writer and educator whose work explores the beauty and tensions of language, culture, and place. Wink grew up on a cattle ranch in the San Pedro River Valley of southeastern Arizona. She has studied and lived in México, Spain, and Germany. With degrees in International Relations, Crosscultural Leadership, and TESOL, Wink is an Associate Professor in the Department of Teacher Education at Santa Fe Community College and works with teachers in the U.S. and around the world. Her book, Teaching Passionately: What’s Love Got To Do With It? (co-written with Joan Wink, Pearson, 2004) explores the foundations of education, literacy, language acquisition, and political, familial, and spiritual influences on education. Please go visit her site, she has lot so extra material related to the book, and cool pictures! WHAT IS YOUR FAVORITE NOVEL SET IN SOUTH DAKOTA? This entry was posted in Historical novels, Quotations, Reading Challenges and tagged Dawn Wink, Lakota, prairie, South Dakota, violence against women by WordsAndPeace. Bookmark the permalink.